Although it goes completely against the mainstream rhetoric, the economy has responded well to the Donald Trump administration. For starters, the markets reached all-time highs when the brash real estate mogul secured the presidency. Later on, the job markets produced better-than-expected figures, and consumer sentiment hit multiyear highs. Everything seems well … except that is, if you’re involved in retail real estate investment trusts, or retail REITs. Major retail stocks such as J C Penney Company Inc (NYSE:JCP), Nordstrom, Inc. (NYSE:JWN), and Macy’s Inc (NYSE:M) suffered significant losses in recent months. Despite seemingly positive data, we have to remember that retail growth overall has slowed significantly. This decade, sector sales growth averages around 4.3%. This compares unfavorably to the 6.5% growth rate seen in the 1990s. Moreover, in the last four years, the rate has slowed to less than 3%. Logically, this has a significantly negative impact on retail REITs. Already struggling with margins and reduced foot traffic, discount leaders like JCP were forced to cut their number of stores. It’s the same story with higher-end outlets like Macy’s. The problem is that the pain endured by the retailer snowballs down to the REITs that provides the physical properties. As more stores shutter their doors, foot traffic dies, thereby squeezing REITs and their investors. Unfortunately, this circumstance may not improve meaningfully over the next several years. Yes, people are getting jobs and circulating money in the economy. But the rise of e-commerce means that a greater allocation of sales are being driven by Amazon.com, Inc. (NASDAQ:AMZN) and the like. That’s wonderful for the overall economy, but it does nothing for REITs, which are anchored to physical sales. As a result, a vast number of REIT stocks have experienced substantial volatility alongside retail stocks. Here are four retail-centric investment trusts you must avoid before things get worse! Inarguably, among embattled retail stocks, the one that is causing the most consternation for REITs is Sears Holdings Corp (NASDAQ:SHLD). As InvestorPlace contributor Richard Saintvilus notes matter-of-factly, “the rise in SHLD stock is nothing more than irrational exuberance.” That’s a hefty zinger, especially for Seritage Growth Properties (NYSE:SRG), which happens to lease a majority of its properties under the Sears or Kmart brand. You might as well dump SRG stock while you have the chance. In fact, the markets are encouraging it. 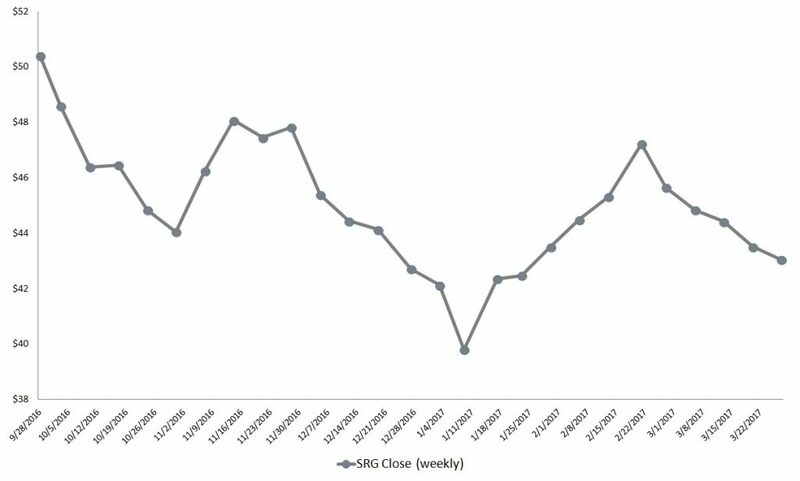 Surprisingly, year-to-date, SRG is up less than 1% from the January opener. However, that is only a technicality. When the ship has more holes than the backstop of a shotgun range, the fundamentals can’t be denied forever. In addition, the long-term trend is very unfavorable for SRG, reflecting deep-seated pessimism. The main takeaway is that SRG stock hasn’t completely collapsed yet. Use that time to put as much distance as possible between you and this most troubled of retail REITs. SRG is about jumping ship while there are still lifeboats remaining. For Pennsylvania R.E.I.T. (NYSE:PEI), this just comes down to survival at any cost. Compared against rival REIT stocks, the chart for PEI is one of the ugliest. On a year-to-date basis, PEI has lost more than 23% of its value in the markets. That’s horrifically devastating, as the first quarter has yet to close. Therefore, one shudders at the thought of what the next three quarters might bring. If the last several months are any indication, PEI investors are in for serious pain for their stubborn faith. Interestingly, PEI stock received a temporary respite when Donald Trump was elected president. In the week following the election, PEI gained about 8%, buoyed by his pro-business message and overall market enthusiasm. Unfortunately for brick-and-mortar shops and the retail REITs that love them, the Trump rally was a facade. 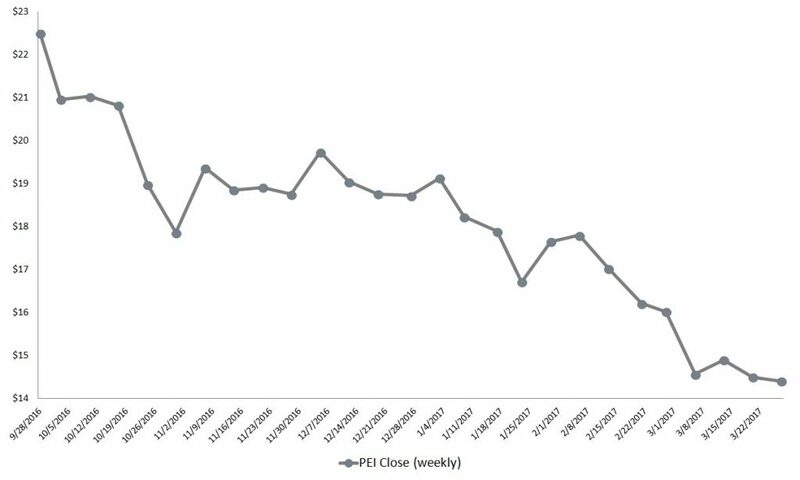 PEI largely traded sideways throughout the rest of 2016. A few days after the opening bell of 2017, the fundamentals came a-knockin’. The firm had no answer to the physical retail sector’s negative sentiment, and investors bailed en masse. Certainly, it’s never easy to cut your losses. But with PEI stock, the markets aren’t handing out too many options. 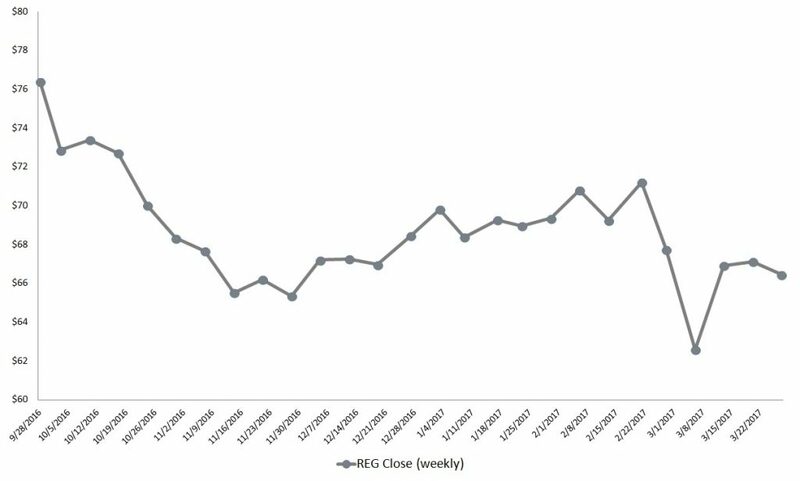 Although it’s not terribly bad at a 4% YTD loss, that shouldn’t be taken as an excuse to go contrarian on Regency Centers Corp (NYSE:REG). Much of the paring of volatility is a result of reactionary trading. From the end of this past February to March 10, REG stock lost more than 12% of its market value. Speculative traders are taking advantage of a respite in bearishness, but this is only temporary. On the surface, I can understand why someone would want to pull the trigger on REG stock. The Regency website boasts of the fact that they have “an average household income of $100,000” across their portfolio. You’d assume affluence in retail can weather the storm. However, some of the worst-hit retail stocks are luxury brands like Dillard’s, Inc. (NYSE:DDS). When a REIT loses its marquee names, that hurts the entire portfolio. The other factor I’m leery about is REG stock’s exposure to the grocery industry. A vast majority — 87% — of Regency property is anchored by major grocers. For the most part, food-related sectors are hurting badly from price deflation. Even if they are higher-end, organic product sellers, business is business. If a company can’t justify holding its doors open, it won’t. Despite deeper pockets, REG can’t escape economic reality. It doesn’t matter how big you are, or how much you dominate a particular market. A downturn is a downturn, and you will be affected. Call it a tough lesson currently being learned in real-time by CBL & Associates Properties, Inc. (NYSE:CBL). 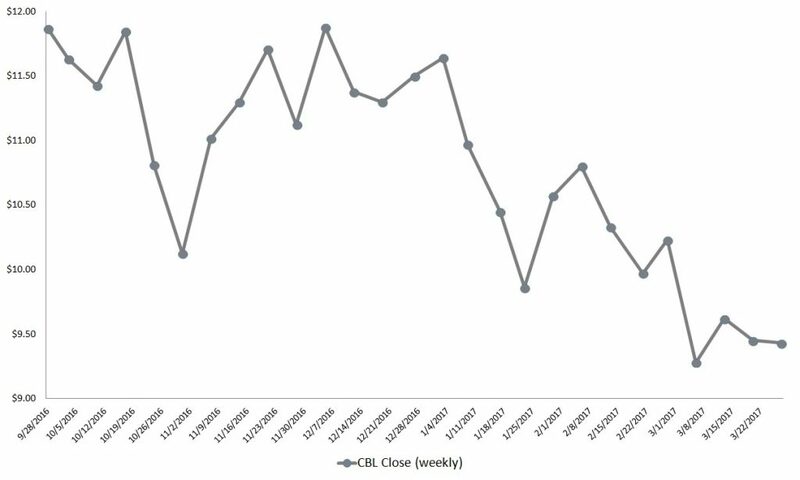 On a YTD basis, CBL stock has shed nearly 21.3% in the markets. This makes it one of the most negatively impacted REIT stocks. On paper, the volatility seems unwarranted. According to their website, CBL & Associates are one of the biggest shopping mall REITs in the nation. Furthermore, they are bolstered by popular establishments like the Cheesecake Factory Inc (NASDAQ:CAKE). Yet the problem remains a radical shift in American consumerism. People are simply not going out to shopping malls as they used to. As a matter of survival, even the most established retailers have to close their doors, leaving CBL straggling. CBL can replace a tenant, but the entire ship is sinking. What it amounts to is a race against time. Unfortunately for CBL and similar REIT stocks, such poor fundamentals don’t make for good investments. Article printed from InvestorPlace Media, https://investorplace.com/2017/03/retail-reits-reit-srg-pei-reg-cbl/.